Christina O’Connell is armed and ready. 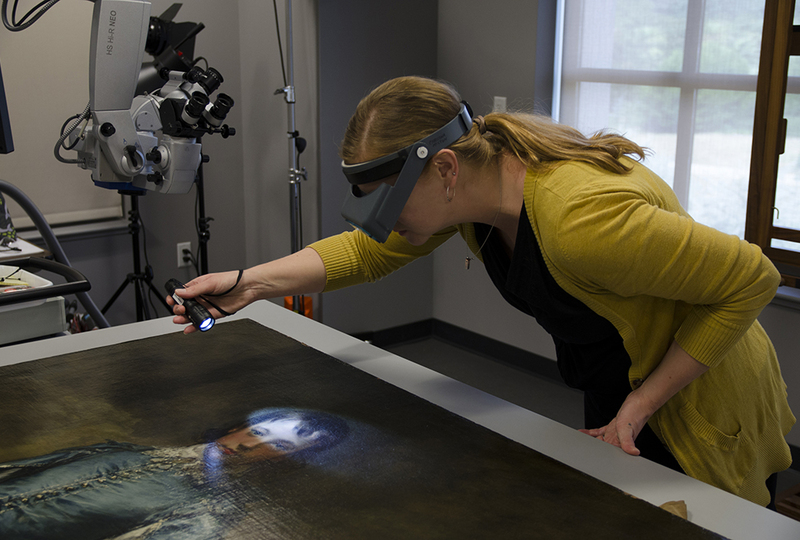 She’s using an array of 21st century tools to restore an 18th century masterpiece. Blue Boy is one of the world’s most recognizable paintings. The eternally youthful adolescent is marking his 250th birthday though, and his age is showing. The painting hasn’t had a substantial restoration in at least 97 years. It’s a bit torn and tattered. Some of its colors have faded. Worse still, some paint is beginning to flake. 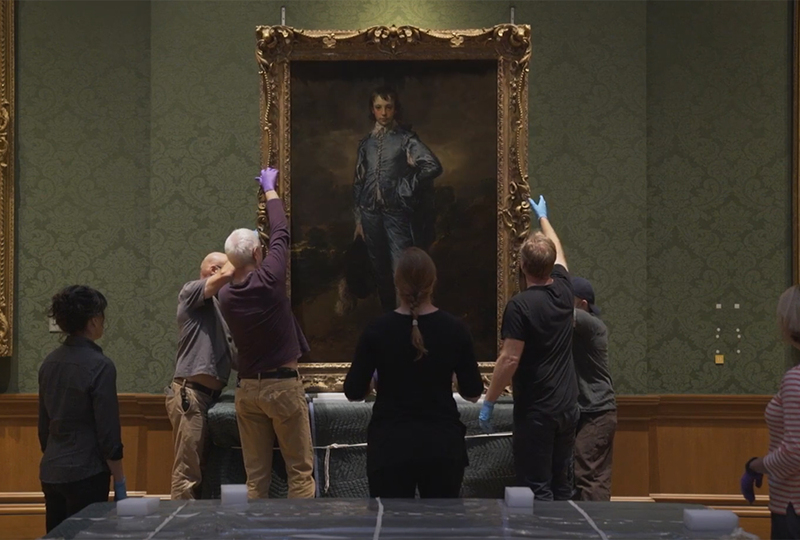 Thomas Gainsborough’s 70-inch-tall oil canvas featuring a British youth dressed all in blue arrived at Southern California’s Huntington Library in 1921. Since that time, it has been one of the most sought-out attractions at The Huntington. The painting has been reproduced countless times. It has even been recreated as small porcelain figures for curio cabinets around the world. Long before there were action figures and movie heroes, Blue Boy captured a culture’s attention. He became an icon, appearing in home and classroom décor for nearly two centuries. The Huntington has no intention of letting Blue Boy’s bright hues fade into oblivion. 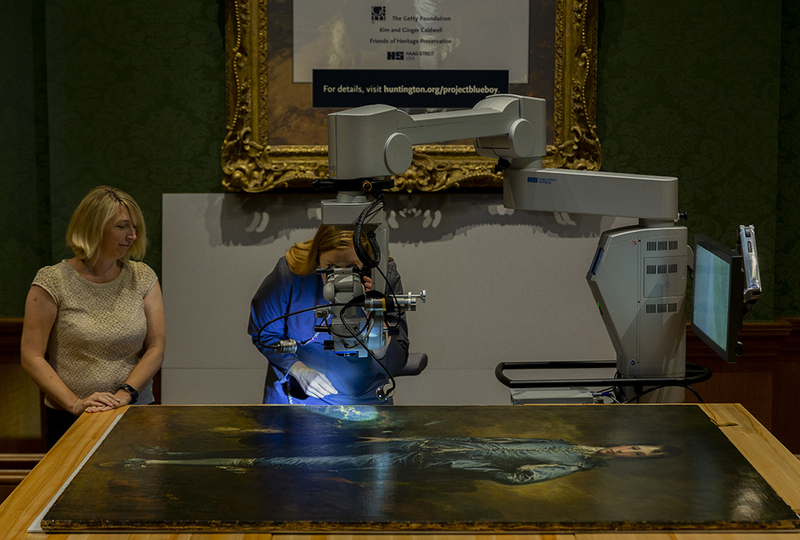 O’Connell approached the giant canvas with a microscope that is taller than she is. 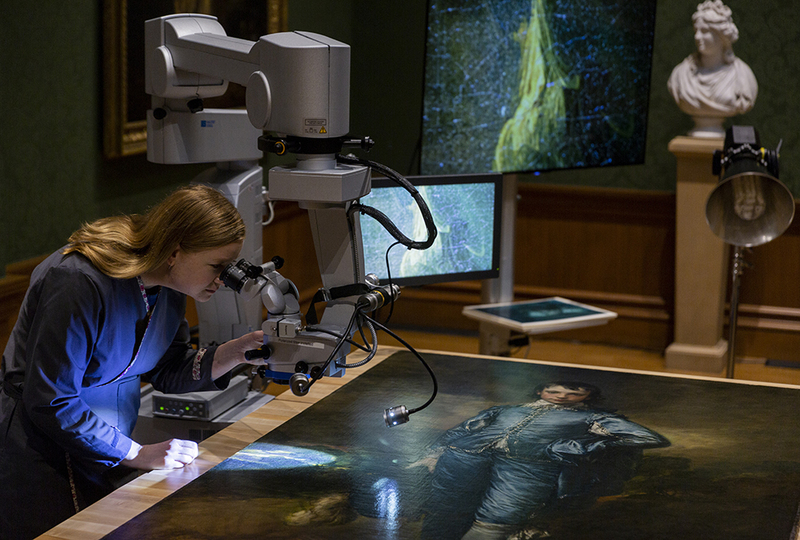 With the six-foot apparatus, she zooms in on the painting’s tiniest details, magnifying them 25 times. Her touch-up paint was created to match the oil pigments Gainsborough used around 1770. O’Connell spent a year preparing for the restoration. She studied digital, X-ray, and infrared images of the famous work before making her preservation plan. She estimates the restoration will take at least a year before the kid will be back on The Huntington’s Thornton Gallery wall. But Blue Boy fans won’t have to miss him completely during that time. In the same area where he has hung for nearly a century, visitors will be able to watch O’Connell at work. During occasional breaks, she’ll stop to explain her process to viewers. “One of the reasons why the painting hasn’t undergone such an extensive conservation treatment before was because people always wanted to keep it on view,” she says. So the library came up with a way to give him his much-needed repairs without depriving his fan following. 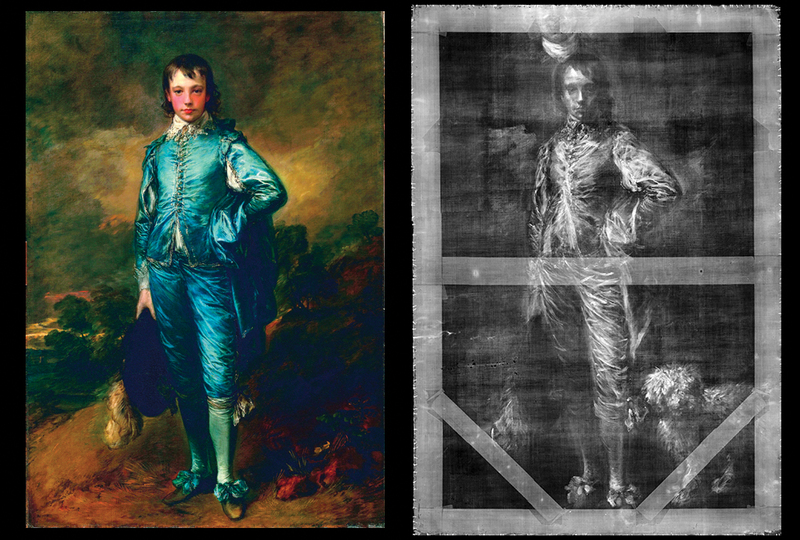 Blue Boy first appeared at Britain’s Royal Academy exhibition of 1770. The artist titled the work A Portrait of a Young Gentleman—but viewers quickly gave him a nickname. Blue Boy he became and Blue Boy he remains. No one can pin down just why the painting had such an immediate and lasting impact. The Huntington’s founder, railroad tycoon Henry Huntington, paid a record sum of money for it: $728,000. Some Britons reportedly cried when they learned the boy was leaving his native country for America. Neat that they can do something like that. I mean, how they figured out that there was something underneath. Restoring it will be pretty difficult. But I wish them the best. That would take a lot of patients to do that i know that i couldn't be that patient. Why are you guys saying it's so sad that a painting is getting restored? It's lust like if you broke the tire on you bike you would get a new tire (or just get it blown up again). but l do agree with Vance H, You would have to be very patient to do that work! l mean just think you were peeling of a little bit of paint that was falling off and *riiiiip* you pull half of the painting off (l know that they are using special tools l am just making a point)! Anyway l think it's kind of ad that Gainsbourgh took the dog off of the painting in the final painting. It also says in the article that the "Blue boy" painting is one of the worlds most recognizable paintings in the wold. I mean before this article if someone said "blue boy painting" l could picture it in my head but l asked some of my friends and they didn't know what it was even when l showed them a picture of it! But if l said the "Mona Lisa" or "The Scream" the would be able to picture the painting in their head. And don't get me wrong l know the said one id the worlds most recognizable painting but still. i have never heard about blue boy but now i kind of wish to watch how Christina O’Connell repaints live and see the final remade painting. I have never heard of this painting but i would be cool to see it in person from reading this. We have a picture of the blue boy in our dining room.